The par force hunting landscape in northern Zealand is an intentionally designed landscape used for hunting by the Danish kings in the 17th and 18th centuries. ‘Par force’ stands for ‘by force (of dogs)’, the noblest form of hunting where a specific animal was run down and exhausted by mounted hunters and dogs before the kill was made. This technique was developed in France and adopted widely across Europe by the royalty and nobility to display their power. The landscape consists of man-made forests and ride systems in a rigid grid pattern. It covers 3 main components: Store Dyrehave, Gribskov and Jægersborg Hegn/Jægersborg Dyrehave. Also, 6 paths formerly connecting Store Dyrehave and Gribskov are included. “You don’t need luck. You need good shoes!”, fellow WH traveller Nan e-mailed me when I told him to wish me luck ticking off the Par force hunting landscape. He was so right, and I’d like to add to others that plan to visit this WHS: also bring snacks, something to drink and a smartphone with GPS. And do read up a bit about what par force hunting entails beforehand. From the 3 main components of this WHS, I had set my sights on Store Dyrehave (“large deer park”). Both Store Dyrehave and a formerly connected second component, Gribskov, lie near the town of Hillerød (the third, Jaegersborg, is located closer to Copenhagen, sees a whopping 7.5 million visitors a year and is already well-covered on this website). Getting to Hillerød already did not prove to be as easy as internet research had lead me to believe. Part of the direct S-train route was blocked, so passengers had to be transported by buses to the final destination. This added another 20 minutes to the 1 hour trip from Copenhagen Airport. Having finally arrived at the station in Hillerød, you'll just have to walk. There is no signposting at all. Beforehand I had carefully studied the route to the deer park and downloaded a map of the area to my phone. Both actions proved necessary, not at least to find the "right" patch of forest: a remarkably similar forest lies on the other side of the main road Københavnsvej - but that is not part of the WHS. Using my sense of direction (and the help of the GPS on my phone) I hiked towards the center of the park. I had given myself a time-box of two hours to catch a glimpse of the meager remains of this former hunting landscape. Those being – according to the nomination file – “markers”, “numerical place names” and “an emblematic marker (Kongestenen)”. It’s like doing a treasure hunt with no clues. So I was quite happy when I came across an original marker for road #8 after a while: these numbered stones signal the 8 main radiating roads that lead to the central point. Store Dyrehave now is used mainly by mountain bikers and joggers. The distances are actually a bit too long to enjoy for hiking and the landscape too monotonous. After an hour though I was rewarded for my efforts: I found the central point, the intersection where the 8 roads diverge in a star shape. I was really pleased with myself, and even rather impressed by the ingenious lay-out of the lanes and the original star stone at the center. Here, the ritual slaughter of the captured animal by the King would have taken place to end it all. It reminded me of a children’s TV series from my youth (‘De Zevensprong’ – Crossroads of Seven Roads): each episode started and ended at the crossroads of 7 roads in a mysterious forest setting. On my way back I took road number 6, one of the other main lanes. It ends at the northern end of the park, where part of the original stone fence is still visible. Close to this exit is a parking lot with an information panel in Danish and English about the park's WH status. In hindsight and comparing the experiences of other reviewers, Store Dyrehave may be the best among the locations to understand what this WHS is about. If you arrive by car (recommended), park it at the main parking lot along Overdrevsvejen. Answering a recent observation by Solivagant (how to handle trips to European WHS that aren’t among the continent’s highlights): I ‘did’ this as a day trip from my home, flying to Copenhagen early morning and returning early evening. My plan was to spice it up a bit by combining a visit to this WHS with the Islamic art of the David Collection. In the end however the WH visit took so long that I didn’t have time left for the museum. This was not a site that we looked forward to because of previous reports. However, we had some good luck here. When we arrived in Hillerod, we spotted a large local map on the main road called Kobenhaven. 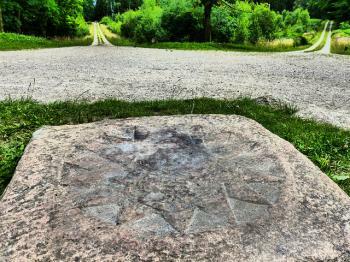 It showed the park’s road grid with its wheel-shaped spokes. Two roads, Kobenhaven and Trebi, a small trail, went directly to the centre according to the map. We parked nearby and walked easily to the King’s stone on the Trebi trail, in no more than fifteen minutes. We were surprised and elated by the ease of discovery. Please note that the paths don’t all go straight; we had difficulty retracing our steps and finding our car again. This site was inscribed in 2015 and I am positive I was not the only one wondering why? Based on the subsequent lackluster reviews, my conclusion was I would visit the site if I could. Once I did decide to visit this WHS, I sought a more substantive experience. In my estimation, a walk in the hunting park alone would probably NOT be that worthwhile, regardless of the gorgeous weather. 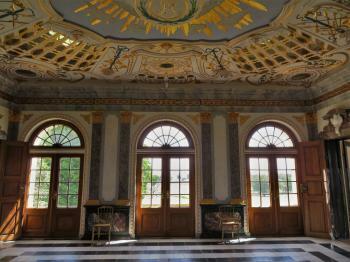 Therefore, I made an online reservation to tour the Ermitage (Hermitage), or Royal Hunting Lodge. This tour is apparently recent, in that public access to view the interior of this 18th century hunting lodge was previously prohibited. Today the tour is offered during the Summer only, English tours are only available on Saturday. The tour cost is high, 125.00 DKK per person (about $20 USD). After arriving by train, I walked to the Hermitage, we enjoyed the sunny weather, the hunting circuit, and the occasional deer that are so prevalent in this hunting park. I would estimate we saw about fifty or so deer during our 45 minute walk. Pleasant landscapes and scenery, royal hunting park or not, this WHS will not be obvious in its OUV. However, I think the interior of the Hermitage, the only major building that contributes to the sites OUV, is a great starting point to understand this WHS. The tour is just under an hour, and you visit all floors. The highlight is the exquisite Dining Hall which (for a while at least) included a built-in lift (elevator) table that would allow servants to prepare the meal without actually "disturbing" guests with their presence. The views are by design very scenic and expand in all cardinal directions. Since the location is so prominent, one can really understand the absolute monarch ideology of having control and mastery over the land itself. To preview what you will see at the Hermitage view this video. I visited this WHS in July 2016. Unknowingly I must have surely passed by parts of this inscribed site when visiting Hillerod a couple of years ago. This time round I was determined to visit the three main parts that make up this WHS. There is very limited information on this WHS, both online but especially by way of information boards or road signs. Since there was an exhibition dedicated to the Par Force hunting landscape as a WHS, I decided to start by visiting the Danish Museum of Hunting and Forestry (closed on Mondays) in Horsholm. I'm wasn't very keen to visit a collection of stuffed animals, hunting exhibits and forestry items but at least I was able to get some more information on this site in North Zealand. The exhibition (not worth the entrance ticket) is just a couple of information boards which would be much more helpful if they were placed at the sites themselves. From Holsholm I drove towards Gribskov Forest which is the least interesting of the three locations. It is a large forest with a huge star-shaped system of paths, yet this can only be really appreciated using drone photography. 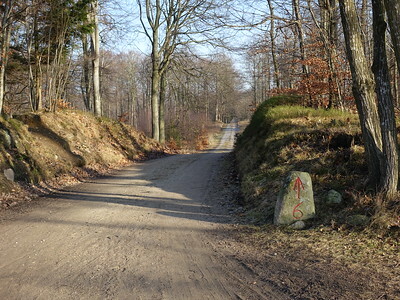 To be able to appreciate the star-shaped system of hunting paths, Store Dyrehave is much better as at least there are several stone markings and bicycle and walking trails (through the paths or through the woods) which all meet at the centre where there is the king's stone with an eroded compass engraving and inscription. I walked 6km to be able to actually see this stone and although I'm not in bad shape it took me quite a while to find my bearings and explore the star system. I wouldn't suggest visiting this place if you don't have a couple of hours to spare. Finding the parking lot to actually start walking one of the trails proved to be quite a difficult task. I drove to Kobenhavnsvej in Hillerod which is one of the main roads which lead to Fredriksborg Castle. Half way through I stopped to ask for directions at a small petrol station nearby and I also had a picture of the king's stone with me to show. All I got back were a series of puzzled looks! Few of the locals seem to know about the WHS inscription, let alone about the existence of some stone! I did not give up and after driving around in circles I saw a narrow road covered with dead leaves and overgrowth and three cars parked. There was a very small information board showing the different trails and I walked in following trail 4 and come back out following trail 3. The king's stone is very underwhelming and most simply use it as a resting spot. For me it turned out to be like a treasure hunt to get there and I had almost given up since I had a flight to catch afterwards from Copenhagen (some 45 minutes away). The easiest way to visit this WHS and actually see something more than a forest and some stones is by visiting Jaegersborg Dyrehave. Most visit this place for golf, hiking or a stroll by the seaside villages. I drove to the Copenhagen Golf Club free parking lot at Lyngby which is the closest parking lot to the Hermitage. I walked for about 2km to the golf club and I could already see scores of deer and stags. From there I walked for about 2km to the Hermitage which I found to be quite similar to the Falkenlust hunting lodge in Germany. Here there is an information board but again no mention of the WHS inscription. All in all I enjoyed my picnic here even though I failed to see any OUV. 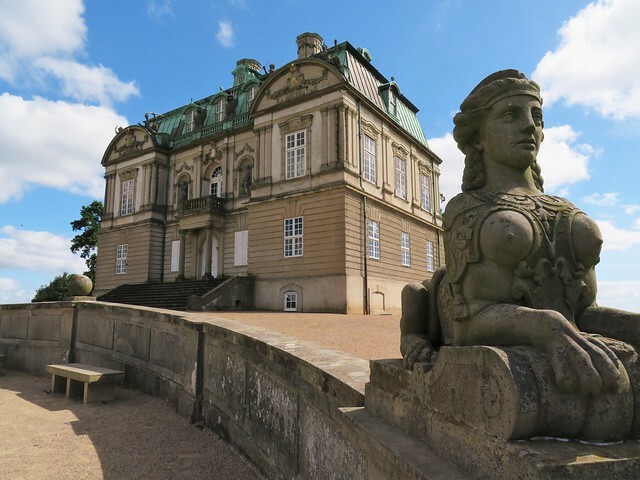 It would be a pity to visit Hillerod without visiting Fredriksborg Castle and gardens. I'm glad I ticked all my previous near misses by visiting this site but it is perhaps Denmark's least interesting site. Ugh, the very nadir of visiting World Heritage sites for me. If you have been to a Baroque Palace, and gone for a really long walk to the far far end of the gardens, to that bit on the map that doesn’t seem to have any redeeming features, then you will have a pretty good idea of what this site is like. 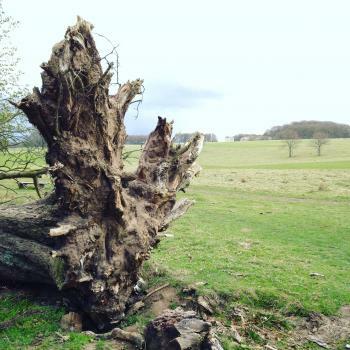 It is a landscape shaped by the landed gentry to go hunting with dogs, and the reality is even less interesting than it sounds. Basically there are patches of trees occasionally separated by straight diagonal stretches of grass which help show the nobility's command over the land (and their subjects) and that is essentially the Outstanding Universal Value of the site. Hmm. If you are really lucky you can catch a glimpse of a dreary medium sized palace on a hill a few kilometres away!! There is a nearby museum and two other patches of land inscribed if you have a stronger stomach for this sort of thing than me. On the plus side, it is a pleasant green space and it is easily accessible from the Danish capital. I imagine if I lived in Copenhagen it would be a charming place to come for recreation at weekends to help burn off some of those delicious Wienerbrød. There was quite a lot of bird life, and I enjoyed watching some golfers play a few holes on the Royal Copenhagen Golf Course, which sits at the heart of the site. The station at Klampenborg offers direct access into the park, though I was more interested in Arne Jacobsen’s Bellavista housing estate on the other side of the station, a nice piece of mid century modernism. But merely being accessible and pleasant isn’t really good enough to become a World Heritage Site in my book. Go for a visit, because you want to get some exercise in a bit of green space near the Danish capital. Don’t go for a visit because it is a World Heritage Site, it will only encourage more of the interminably middling European landscapes to try and get inscribed on the list and drag down its good name. I feel somewhat embarrassed at having indulged it. I may have gone a little overboard with my condemnation, but to be honest this is probably the worst WHS I’ve visited. Originally constructed to serve as the king's private hunting ground, the parforce hunting landscape in North Zealand nowadays is a recreational area just north of Copenhagen. It's a large forest/park that also contains a golf course and an amusement park. In the center of the park (Jægersborg Dyrehave = Hunters Castle Deerpark) you can easily spot deers, a legacy from the hunting days. I went there on a sunny day in May. It was a pleasant experience and I was itching to go for a run. In a way I did, as my schedule was rather short and in the end I needed to hurry a bit to get to the station on time. Plan at least 2-3h, the park is huge. I am a bit hard pressed to see the OUV of this site. It's a very pleasant park and if I was living in Copenhagen I would frequent it regularly. But even after reading the nomination file for a third time I am hard pressed to see the OUV. There are two railway stations next to the park. Skodsborg Station (North) and Klampenborg Station near the main entry (South). Connections from Kopenhagen Central Station are frequent. My recommendation would be to go to Skodsborg first and then walk through the park to Klampenborg. With Kopenhagen as your center you can easily visit Roskilde, Stevns Klint and Kronborg. Kronborg is on the same railway line as Klampenborg and Skodsborg. 8 of the 9 locations are near the town of Hillerød, which can be reached by direct S-train A from Copenhagen Central Station. The 9th location, Jaegersborg, lies on the railway line between Skodsborg Station (North) and Klampenborg, also directly accessible from Copenhagen and even the Airport.